Your little star will absolutely adore the KidKraft Medium Diva Bedroom Vanity Set. This cute vanity and stool will provide endless hours of entertainment for your child. 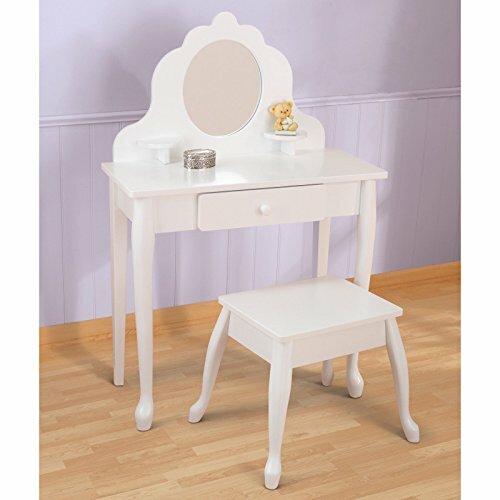 The make-up vanity is finished in a lovely white lacquer and has beautiful ;Queen-Anne style legs. On top of the rubberwood vanity is a fun oval mirror made of unbreakable Plexiglas. On either side of the mirror are shelves for anything your little one chooses. There is also a drawer in the table for storing all of her things. This dressing table set requires some assembly. For ages 3 to 8. KidKraft is a leading creator, manufacturer, and distributor of children's furniture, toy, gift, and room accessory items. KidKraft's headquarters in Dallas, Texas, serves as the nerve center for the company's design, operations, and distribution networks. With the company mission emphasizing quality, design, dependability, and competitive pricing, KidKraft has consistently experienced double-digit growth. It's a name parents can trust for high-quality, safe, innovative children's toys and furniture. Antique white vanity set with matching stool. Composed of safe and durable rubberwood . Recommended for ages 5 to 10 years. Classic white lacquer finish accentuates any little Diva's bedroom . Spindle Queen-Anne style legs on vanity and matching stool . Unbreakable plexiglass mirror features lovely scallop design . Sconces hold small trinkets and other knick-knacks. Dimensions: 26.5W x 12.5D x 40H inches.